We angels watch with great curiosity as Satan takes on the form of a serpent, actually a dragon, and tempts you humans’ first parents to disobey God, bringing death to them and all their descendants That includes human every man, woman and child. Oh, look, Eve, how wonderfully good everything God made is! The trees are so majestic! Just look at these trees! Aren’t they beautiful? (Stand near Adam with arms outstretched like limbs.) We are trees! Aren’t we beautiful? 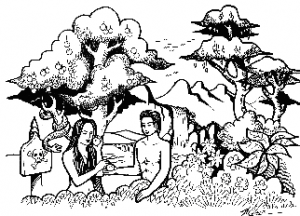 Oh, Adam, just look around this marvelous garden of Eden! It’s a paradise! Our beloved Creator has made everything for our happiness and enjoyment. It could not be better! Listen carefully. From any tree of the garden you may eat freely; but from the tree of the knowledge of good and evil you shall not eat, for if you eat from it, you will surely die. There is a strange beast. It looks like a dragon, a very crafty one at that. I wonder if it can talk. (Hiss as you talk) Indeed I can talk, young lady. Indeed, has God said, “You shall not eat from any tree of the garden”? Ah… From any tree we may eat, except from the tree in the middle of the garden. Ha! You surely will not die! God just said that. He knows that when you eat from it your eyes will be opened. Hmm. Well, the fruit on that tree does look tasty, and it’s pleasing to the eyes. Ah, but it will also make one wise. Just think of that! Well, I’ll just eat one. Adam! Try this! It’s good! (Look down and shout) Oh, no! I’m naked! That fruit somehow opened my eyes to see what I had not noticed before. Oh! What will we do! I’ll sew fig leaves together and make aprons for us. Oh, no! I hear the Lord coming. Let’s hide! It’s no use! Lord, I heard you come and I was afraid because I was naked, so I hid. Who told you that you were naked? Did you eat from the tree that I forbade? The woman that You gave to be with me, she gave me from the tree, and I ate. Eve, what is this you have done? The serpent deceived me, and I ate. Serpent, because you have done this, you are cursed. You will crawl on your belly eat dust. He shall bruise your head; you shall bruise his heel. Eve, you will bear children with great pain, and your husband will rule over you. and you will earn your bread by the sweat of your face until you return to the ground, for you are dust, and to dust you shall return. God made garments of skin for Adam and his wife. Then, he drove them out of Eden, and stationed me and my fellow angels with a flaming sword to guard the way to the tree of life. Paul called Jesus “the final Adam” (Rom, 5:12-21). In what way is Jesus, like Adam, the head of a race? In what way did Jesus reverse the universal effect of Adam’s sin?